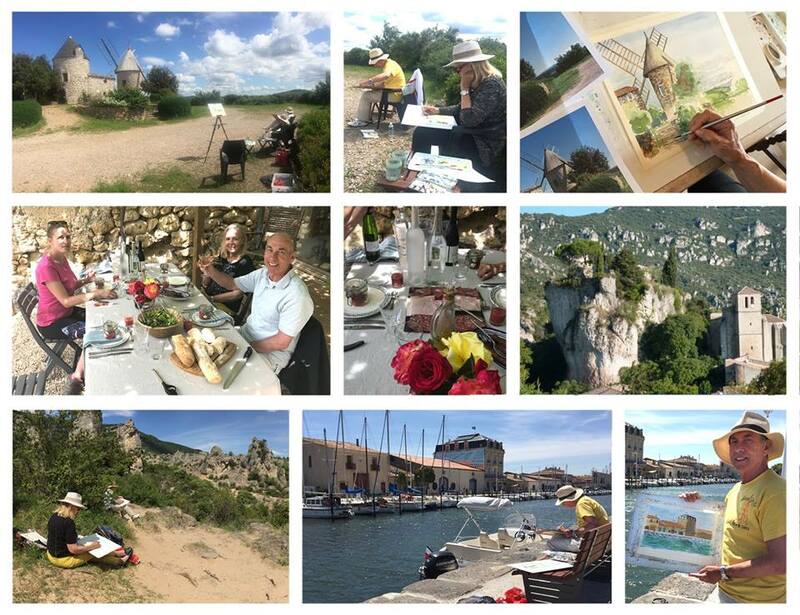 Painting Holidays in the South of France – here we go! Our first Painting Holiday guests arrived at the end of May, as temperatures began to rise – four ladies from America: Kasia and Mary Jo travelling together from just outside Washington and Emanda, with her mother Sandra, all the way from Texas. Coincidentally, they’d spent a few days enjoying the sights of Paris before taking the fast train down to Beziers on the Mediterranean coast, where we all met each other – for the first time! After settling in to their accommodation in the nearby village of Neffies, we enjoyed a welcome drink together before driving to the historic village of Pezenas for our first evening out. 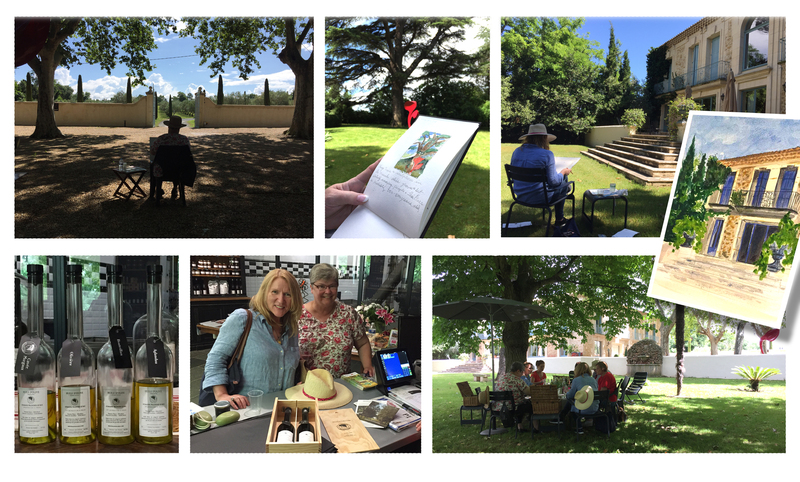 The week rolled easily by and we drew and painted, wined and dined around the region, eating at a mix of fine restaurants, enjoying Chic Picnics and beachside cafes as well as tasting and sampling plenty of regional wine. There was a good mix between painting en plein air and studio work where we worked with reference photos taken earlier in that day. Venues included Old Watermills, the Canal du Midi, an Olive farm, and finally onto the shores of a Mediterranean lagoon. What I really enjoyed was that Sandra, Emanda’s mother, already in her 80s, was visiting Europe for the first time. Being with someone who’s experiencing all this for the first time was very special – right down to the last hours when we managed to give Sandra the opportunity to paddle in the Mediterranean ( a life-long wish) before flying on to Amsterdam from Montpellier airport. 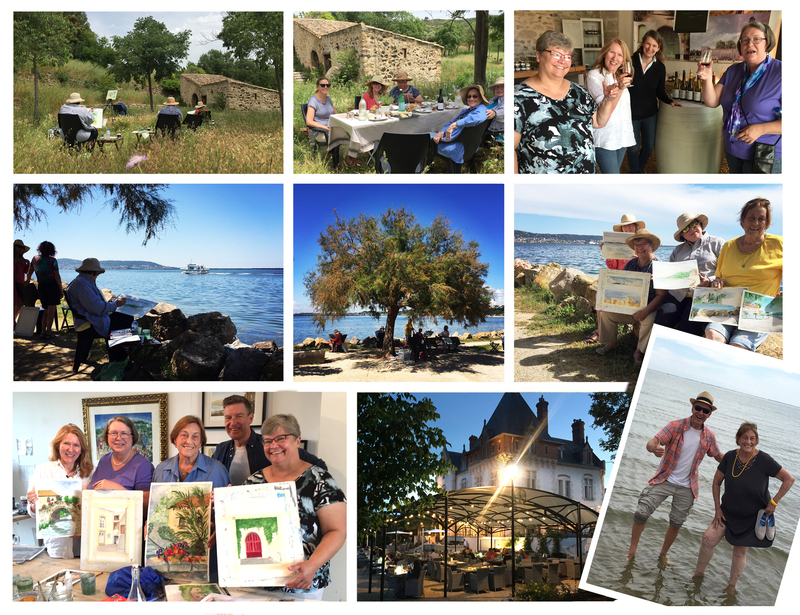 I could write many more paragraphs but as the saying goes, ‘a picture tells 1000 words’, so here’s a montage of just of the moments from our first Painting Holidays in France 2018. Some places available in September for our next weeks. Hope to see you then!